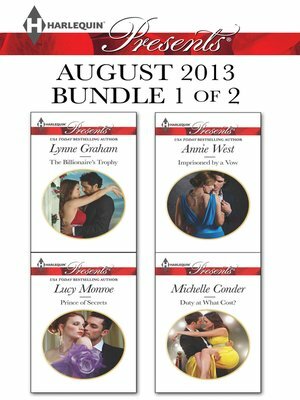 Harlequin Presents August 2013 - Bundle 1 of 2: The Billionaire's Trophy\Prince of Secrets\Imprisoned by a Vow\Duty At What Cost? Harlequin Presents brings you four new titles for one great price, available now for a limited time only from August 1 to August 31! Escape with royalty and billionaire tycoons in these four stories by USA TODAY bestselling authors. The Billionaire's Trophy by Lynne Graham, Prince of Secrets by Lucy Monroe, Imprisoned by a Vow by Annie West and Duty At What Cost? by Michelle Conder.